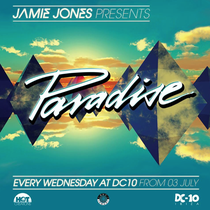 Jamie Jones’ Paradise makes its return to Ibiza this summer on Wednesday, July 3. Jamie brings his signature groove, as well as a spectacular new roster of guests including Richie Hawtin, Loco Dice, Four Tet, Tale of Us and more to DC10 for 13 nights of parties. Jamie has carefully chosen this year’s lineup to include some of the best artists from across the music spectrum. The wide range of talent from artists such as DJ Koze, Tom De Mac and Deetron, to contemporary DJs like Dixon, Magda and Joy Orbison, coupled with the intimate setting of DC10 aims to ensure that each Paradise should be a unique experience.